Description Well, well, you are going to recreate life using a colorful source of energy. 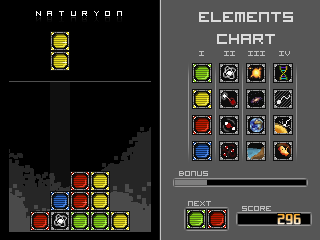 You want to put 3 blocks in a row or next to each other to produce a new element. Sometimes, it does not work the way it should because it is just alchemy. As you are provoking chain reactions, you can get bonuses. Your score depends on the value of the elements you have created. Oh, and you lose once your pile goes past the top line.